You can do it, Michael!!!! I want to wish a happy new year to all of you here. And I want to do this on this thread because i know every tifosi here isn't having the new year's eve they wanted, because of this accident that michael suffered. I sincerely hope that all of you, whom i've come to respect and care during these years, find hope in michael's recovery. I joined this community in 2008, but only really got involved in conversations during a time that was just like this one, which was when felipe had that injury. since i followed the brazilian press closely i was in a position to add reliable information to all of you, who were (like myself) very concerned. This time around, since Michael is german, i can't add information, the only thing i can contribute with in this forum, in this thread with my fellow tifosi is the hope, and the reminder that it is possible that things will work out fine. I noticed that this time, unlike the time felipe suffered the injury, people are fighting and saying things they shouldn't, so i just would like to say to you guys that in times like this we need to pull together and not fall apart, we need to remember that the most important thing we can wish for michael right now is that he is able to survive this, and have as little demages as possible. He isn't a current driver for us, but there is no doubt that he is a ferrari man forever, always will be, and for that reason alone we should only support him, he has given the tifosi so much joy, and right now the biggest joy he could give us is by simply staying alive. So let's behave the way we did when felipe was in this position, it doesn't matter if things like that happens driving a ferrari F1 or skiing after you are retire, he is one of us. I love reading the special michael's momments that some of you has shared with us, please keep doing that. Michael wasn't my favorite driver, but his work for ferrari made me respect him, and be grateful, and also all the work and money he has always given to charity, really made ferrari proud to have someone like him, as a driver and as a human being. I'm specially pulling for him, cause i was a big senna fan, and the pain of losing him was devastating, so my wish is that germany, michaels fans, tifosi, and F1 fans won't have to go through what happened in 94. Death or serious injuries, doesn't turn people into saints, but it sure makes you remember all the times they provided millions of people happyness, and that's what i think we should focus on. I know i'm not a mod or even one of the important members here, but i would like to ask the members that can follow the news closer (like those from germany) to keep us informed as much as you can, during times like these, we usually keep checking here many times daily for upates or any news. I would like to thank you guys already for keeping us informed, since felipe's injury i trust this forum with reliable information more than any other media sources, because here the informations are passed on by people who cares, and not news outlets that wants to exploit the situation. Again i'm not a mod, but as a simple member i ask please try and use this space only to give updates you come across, support to michael, his family and friends, but most of all i ask you guys to use this space to give each other support as we did in 2009. it made such difference, it was the one place that i would feel optimist about things, and it was all thanks to your support. Forza Michael and forza to all of you my friends. we will get through this together as we've done it before. Thank you for summing this up so well. I am in agreement with you totally. I have always been a loyal devoted and at times mad fan of Michael. I do not post very often but this time I had to say something about the debates that were taking place. I will unite with any genuine fan because I do believe our united approach will be a force and a comfort for him when he is well and his family right now. To now understand that he was not speeding and had responded to a friends fall and that this truly was a freak accident is something that I hope those that have posted disrespectful opinions will reflect upon. I am not bothered how it happened but I wish it hadnt. I will stand in line with all Michael Fans to send my best wishes for a recovery and he is in my prayers as our his family hourly. Happy New Year to you and all fans and ..... Forza Miachel and forza to you all and I agree we will get through this together and please can we just have supportive updates and genuine supportive messages. Thank you respecfully. Michael Schumacher, the most successful Formula 1 driver in history, remains in a stable but critical condition in hospital, his manager has said. Sabine Kehm said he was being carefully looked after, and that she would not comment on rumours about his condition. Schumacher is in a medically induced coma in hospital in Grenoble, after he suffered head injuries in a skiing accident in the French Alps on Sunday. Doctors said on Tuesday that he had shown signs of improvement. But they added that he was still "not out of danger". 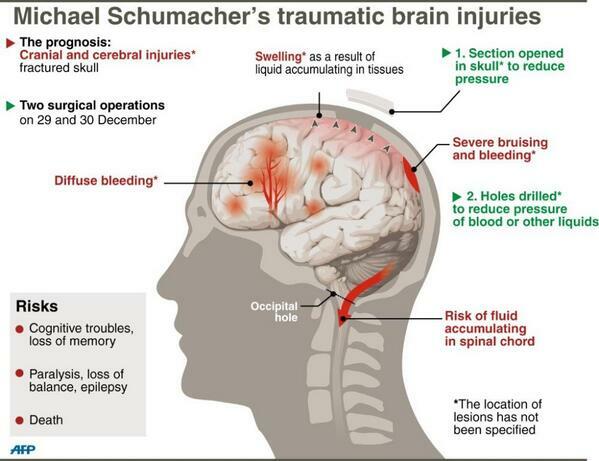 They will not give any update on Schumacher's condition on Wednesday unless it changes significantly, Ms Kehm said. "The good news for today is... there's no significant changes,'' Ms Kehm told reporters and well-wishers outside the hospital. But she added that the situation remained critical. Doctors say they cannot give a prognosis for his condition in the coming days and months. But it is medically possible for someone to spend several weeks in an induced coma and fully recover from it. Stable is good. I remember when Felipe was in hospital, each day the news got the tiniest bit more positive and I hope this is the case for Michael as well. Hoping not to hear anymore today. Poltergeistes, F1Jan and Suzie, you've said it all and I agree 100% with your views as I'm sure any human being and especially any F1 fan would do. Not a lot more can be said but it still strikes me as weird that two drivers so close to heart of Ferrari have suffered these terrible injuries. Forza to them and indeed the rest of us Tifosi who will stand by our boys whatever befalls them. Let's pray for a happier new year all round. In endless sea of great memories that MS brought to me as Ferrari fan, two of them really stands out. 1998 - Hungarian GP. In race change of strategies from 2 to 3 stops to overtake MH, and to take one of many magnificent race wins. I was there and witnessed miracle! 2001 - Hungarian GP. Again I was there. At that time friend of mine and myself were making specialized F1 magazine here in Serbia. I got press pass from FIA, so I was there as journalist for my own magazine. This picture was taken after Saturdays qualifying. Good that he is stable, let's hope it's the start of the recovery. He need a bunch fast laps like the old days! I much prefer - he's just gone fastest in FP1. Kehm, Schumacher's long-time press aide, said there will be no official comment from his neurosurgery team on Wednesday as has been the case for the past two days. "Michael's condition has been carefully supervised all the night and has remained stable also this morning. For the moment, the good news for today is that we will not hold a press conference because there are no significant changes. Still, the condition overall is critical." The injuies are very profound. He needs a whole race of fastest laps! Then again he has done it before so lets pray he can do it again. He has given so much to the world both on and off the track. The injuries and the mood remind me of so many other race car drivers who experienced the same fate. Lets hope and pray that this good man still has work to do on this good earth and God will allow him to do his work for a little while longer. Go in Vein!! You are and will always be a fighter..please please Fight. I wouldn't take any notice of that picture of supposed injuries. the details haven't been released. With all the news reports it's difficult to keep hold of the facts but listen to the press conferences and official statements. I know. We would all most definitely prefer that scenario. Unfortunately, passing Chilton for 21st is a more realistic analogy. 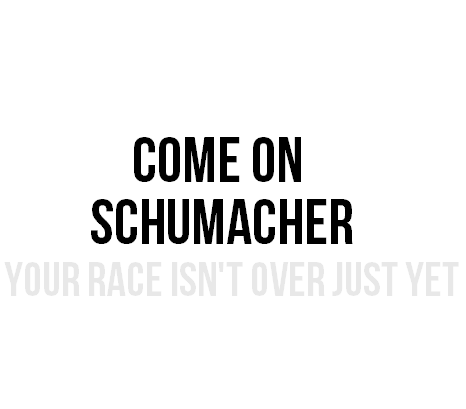 Fortunately, this is Michael Schumacher we're talking about. "And regardless of what else you put on, wear love. It's your basic, all-purpose garment. Never be without it." This may have been mentioned already but I would thoroughly recommend following Gary Hartstein on twitter @former_f1doc His tweets have been keeping me sane over the past few days explaining the medical procedures and what the terminology means. I feel Michael will pull through. His extreme fitness is a big plus and if you are receiving Michael (we are never sure how much of the brain & hearing are active when the patient is in a coma) then you know we are all there with you suffering, waiting and hoping. Stable is good and much better than something worse. His brain and body need to heal and mend the broken pathways. I can tell you that WHEN Michael wakes up, he will have one Hell of a Headache and he can't even take any "Dos Bayer Aspirin". Lets keep on praying for our classy hero. I feel a re-run of Hungary 1998 coming on! Tomorrow Michael is turning 45. One wish. Whats the biggest problem for Michael now? Is it the many brain lesions they´ve mentioned? Yes, cerebral injuries, if everything continues to be OK, it will take four or five more days for the bleeding to completely stop and the swelling to reduce. I don't think we will get any major news during this period. I'm following Gary's tweets too and indeed, very informative. He explains a lot of what is going on. I think this is sweet and just shows how much he is respected.